The 0 value returned from NotifyAsync mirrors the way it's done in the TotpSecurityStampBasedTokenProvider included in the Identity library. I don't call through to the store in the ValidateAsync method because the user argument will have been retrieved by the manager just before this method call so there's no point duplicating data access. Now if you go to the link contained in the callbackUrl variable in the controller action you can reset a user's password. Give your persistence layer some kind of a password reset token. Create a class which implements IUserTokenProvider. Pass that class to your UserManager class as the manager's UserTokenProvider. The IUserStore has to be used by default so isn't included. Whenever we want to use a piece of the manager's functionality generally all we need to do is implement the missing interface on our store. This makes limiting access to certain actions very easy. Additionally because everything uses interfaces with generic parameters no assumptions are made about our persistence layer. A Role requires a certain number of points and a user has points (which should probably be in a UserPoint table). This is not a brilliant way to implement this model but serves as a warning to future generations (example). 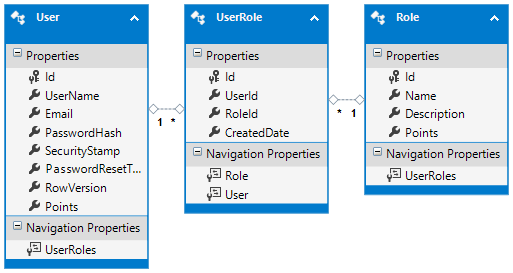 It would make sense to have a composite primary key of RoleId and UserId in the UserRole table however I've opted for a single column primary key in case UserRole evolves into some kind of business entity. Again the fact I'm using Database-First Entity Framework shouldn't matter here because all that you need to worry about is how to implement your own version of the IUserRoleStore in your store. The ChangeRoleMembership method and ChangeType enum are just things I've implemented and can be swapped out for your own methods. Without any further changes you should be able to use the roles in your controller attributes. Create some Roles feature in your persistence layer. Add the IUserRoleStore interface methods to your user store. Hopefully this tutorial series shows how easy it is to make the Identity 2.0 system do what you want. If nothing else you should now have the information necessary to find out what the UserManager expects and provide classes that comply with its demands. 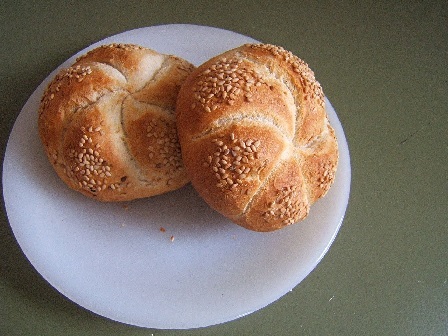 Roll Image from: http://nl.wikipedia.org/wiki/Bestand:Kaiserbroodjes1151.JPG. Yes I really did scroll through the roll category on Wikimedia... because I care.